Schools should be treated as target zones. It’s time to secure them. Students, friends and family gather at the memorial crosses at Pine Trails Park in Parkland, Florida, to remember those who were killed and injured in the Feb. 14 shooting at Marjory Stoneman Douglas High School, Feb. 16, 2018. At least they’re doing something, which is about the most one can say about Florida’s gun bill. The bill raises the age to buy a gun from 18 to 21. While this is a sensible move for myriad reasons and, indeed, might have made a difference in the Parkland case (the alleged shooter was 19 and bought his weapon legally), many similar killers have used guns they didn’t personally buy. Even so, the age change, as well as a three-day waiting period and a provision for greater resources for mental health, surely can’t hurt. To predictable arguments that 18-year-olds in the military are permitted to carry serious artillery, we should never confuse the requirements of combat with the ordinary demands of civilian life. Under my dictatorship, we’d permanently reset the official age of adulthood to 21, which, by most conventional markers of adulthood, is generous in its assumptions. To the pertinent point, most school shooters are under age 20. Florida’s state senators did not restrict the sale of assault-style weapons, despite the fact that 62 percent of Floridians polled say they would support such a ban. Instead, the legislators endorsed perhaps the dumbest idea ever to tumble from a U.S. president’s lips. The Republican-majority Senate bill picked up the armed-teacher challenge and proposed arming certain teachers — including coaches, teachers who are current or former law enforcement officers, members of the military and teachers in a Junior Reserve Officer’s Training Corps program. Other classroom teachers would not be allowed to participate in this all-volunteer, school-days militia. At least we’re no longer trying to imagine Miss Crabtree dropping her algebra textbook and reaching for the Glock in her Spanx waistband. In making his pitch, President Donald Trump suggested that if someone like, say, retired four-star Gen. John Kelly were a teacher, parents might like for him to have a gun. Yes, and I’m thinking that when field generals start teaching math in Miami, I’ll put on my Mary Poppins dress, grab my flying umbrella and a basket of daisy cutters, and report for duty. Any combat veteran will tell you that you don’t know how you’ll react to enemy fire until you do. Even the bravest sharpshooter may be no match for the overwhelming power of weaponized insanity. How likely is it that a coach, no matter how brave, would prevail over a 19-year-old “with issues” and a semiautomatic weapon? You’ll find your answer in the armed deputy who decided not to enter the Parkland school. The real concern, of course, is crossfire — the child straggler wandering the halls, the unintended consequences in a pop-up war. We’re not talking about a Hollywood SWAT team. We’re talking about a man or woman in direct combat, probably with an inferior weapon. And God forbid a school employee should accidentally kill a child. This possibility alone should be sufficient to dissuade legislators from engineering potentially worse scenarios. At best, it seems, we should limit any armed personnel to legitimate, third-party operators with extensive training and field experience. Let them bear the burdens of terror and the liability of error. 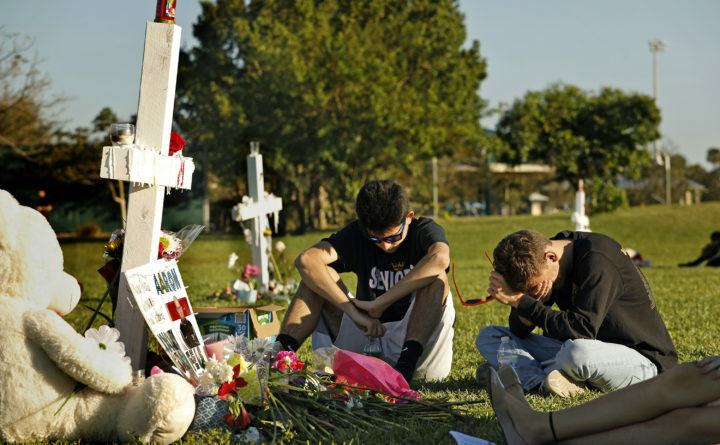 Andrew Pollock, whose precious daughter was shot nine times at Stoneman Douglas, has argued convincingly that lawmakers should focus first on securing the schools — and bicker about guns later. Rambo-ing the perimeter is only part of the fix. Whither the fob? Here in Washington, everyone passes through some level of security in the course of a day. Such is life in a target zone. My apartment building has few exterior doors and none are accessible without a security fob. To reach my office, I have to pass through three checkpoints using a personalized security badge. Most retailers now have a serious-looking security presence. Given recent history, schools should be treated as target zones, too, and security starts at the door. Converting schools to secure institutions will be costly and time-consuming. But, realistically, what choice do we have? If maximum security is good enough for Washington, surely it’s good enough for our children.